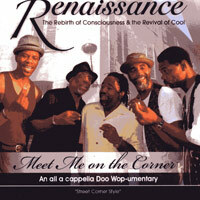 Renaissance is an all a cappella quintet, dedicated to showcasing and preserving the critical art form of street corner style; doo-wop singing. The group is equally adaptable to film, TV & stage as they are beneath the street lamp. Not just another singing group, Renaissance intertwines social and cultural awareness themes in their music offering "food for the spirit" as well as the soul. Whether it's a soul stirring tribute to the legendary Sam Cooke, love songs for the ladies, Black History themed conscious music or a rousing Gospel celebration, their superb vocal skills shine through. These Cats can flat out sing and their infectious energy is quite entertaining as they transport their audience to another space and time. "Meet Me" is an all a cappella Doo-Wop album that recreates the street corner experience of the 50s and early 60s and pays homage to the genius of Sam Cooke, Clyde McPhatter, Harvey Fuqua & the Moonglows along with other Doo-Wop pioneers. It was the brainchild of Maurice Kitchen, an award-winning Chicago musical playwright and producer who assembled an all-star group in Los Angeles, Torre Reese of New Orleans, Kwame Alexander from Memphis, Charles (Sonny) Banks from San Antonio and Anthony Snead from Newark. These 24 songs, songs like "It Don't Have to Change," the lone contemporary song on the album, "Feeling the Blow," "Sincerely," "This Magic Moment," "Money Honey," "Chain Gang," "So Much in Love," "Speedo," "Blue Moon" and the title tune, use the group's comments and recollections to create a feeling in us what it was like to harmonize great music on the street back then. Authentic early Doo-Wop harmonies from these finger-snapping, sweet-singing veterans, who are having big fun recording this, and very shortly, so are we!